Hood River is just barely in Oregon, right? I know that this blog usually focuses on Washington breweries and Washington beers, but I’ve had a beer crush on pFriem Family Brewers since it first opened. Oh, and the beer is widely available and much-enjoyed in Washington, so there you go. Received news recently that two of pFriem’s most popular beers are now conveniently available in aluminum cans. 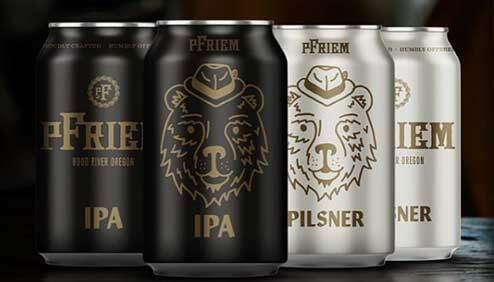 January 14, 2019 – Hood River, Oregon – pFriem Family Brewers, one of the most award-winning breweries in Oregon, announced today that the brewery’s beloved IPA and Pilsner will be available in cans beginning in early March throughout Oregon and Washington. Both beers will continue to be made available on draft and in bottles. While IPA and Pilsner are definitely the first two styles pFriem will can, the company has indicated that in the current dynamic craft beer market it’s difficult to predict which future styles it will introduce and when. Producing over 100 unique beers every year, it’s easy for the company to imagine some of those coming to cans after it launches IPA and Pilsner. pFriem noted that the brewery will continue to express its wide variety and brand depth through its 500ml and 375ml bottles. Full press kit for the cans is available here. pFriem Family Brewers (pronounced “”reem”) is a Northwest, German, and Belgian inspired 15-barrel brewery and tasting room in Hood River, OR. Founded in 2012 by Josh Pfriem, Ken Whiteman and Rudy Kellner, pFriem has experienced incredible growth in its short six years and has earned prestigious awards, including being named GABF® 2018 Mid-Size Brewing Company of the Year and numerous medals in national and international brewing competitions. Best known for artisanal beers influenced by the great brewers of Europe while staying true to homegrown roots in the Pacific Northwest, pFriem craft beers are unmistakably unique in both flavor and balance. Visit pFriem online at www.pfriembeer.com, or onsite daily at 707 Portway Ave., Suite 101, Hood River, OR 97031.